Cougars and Bears, Oh My! Ages 6 to 12. Presented by Nature Vision. What would you do if you encountered a cougar or bear in the woods? 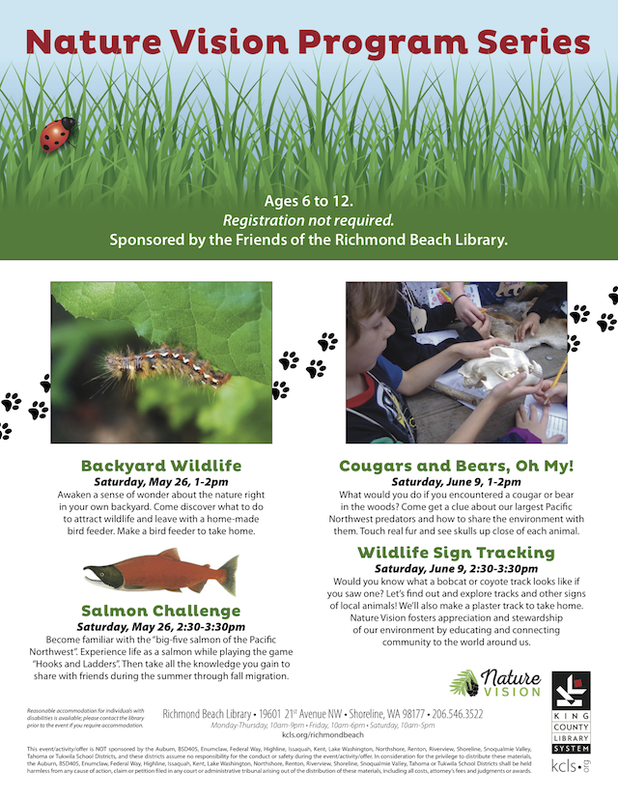 Come get a clue about our largest Pacific Northwest predators and how to share the environment with them. Touch real fur and see skulls up close of each animal. Registration not required. Sponsored by the Friends of the Richmond Beach Library. Ages 6 to 12. Presented by Nature Vision. Would you know what a bobcat or coyote track looks like if you saw one? Let's find out and explore tracks and other signs of local animals! We'll also make a plaster track to take home. Registration not required. Sponsored by the Friends of the Richmond Beach Library.